Stuffed Paprika with meat filling. Recipes from Russia. 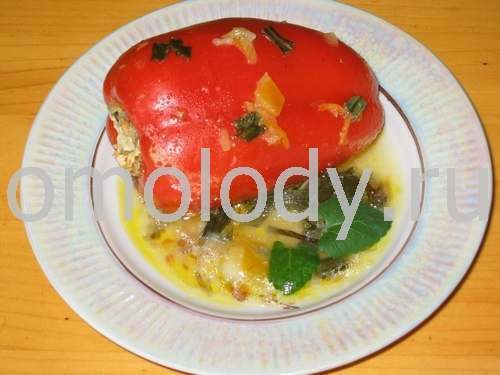 Stuffed Paprika (with meat filling). salt, pepper, greenery, bay leaf to taste. 1. Cut tops off paprika and clean out seeds, save tops of paprika, trim a little off bottom, so they sit up rite. 2. Mix together rice, chopped onions, meat, beaten egg, ground greenery, spices and salt. 3. Stuff in each bell paprika till filled evenly. 4. Place paprika tops on top of paprika in pot. 5. Pour chopped tomatoes over them and tomato sauce and simmer for 1 - 1,5 hours. 6. Fry flour in oil until golden and add to paprika. 7. Season with salt, chopped green Celery, dill, parsley, green onions, bay leaf, pepper to taste. Stuffed Paprika could be very good with cream.